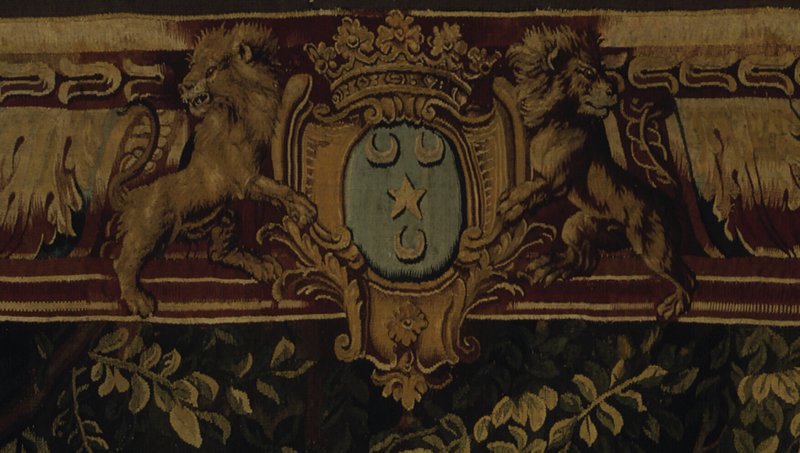 Markings: A coat of arms of the Camus de Pontcarré de Viarmes de la Guibourgère family is woven in the center of the top border. Studies made by two Dutch artists during an exploratory expedition to Brazil from 1637 to 1644 were the inspiration for this tapestry. The newly appointed Dutch governor, Prince Johan Maurits of Nassau, led a group of scientists and artists, including Albert Eckhout and Frans Post, to Brazil, where they studied and painted the unusual plant and animal life of this country. Many of the plants, fish, birds, and other animals woven in this hanging can be traced to life studies made by Eckhout and Post in South America. French artists at the Gobelins manufactory, who designed the cartoon to heighten the tapestry's impression of drama and exoticism, probably introduced other animals, such as the Indian rhinoceros and "striped horse" or zebra. Possibly Jean-Baptiste-Elie Camus de Pontcarré, seigneur de Viarmes, French, 1702 - 1775 and his wife, Françoise-Louise Raoul de la Guibourgère, French, , by inheritance to Louis-Jean-Népomucene-François-Marie Camus de la Guibourgère. Louis-Jean-Népomucene-François-Marie Camus de la Guibourgère, French, 1747 - 1794, by inheritance to Alexandre-Prosper Camus de la Guibourgère. Bernard Blondeel (Antwerp, Belgium), sold to the J. Paul Getty Museum, 1992. "Acquisitions/1992." The J. Paul Getty Museum Journal 21 (1993), p. 141, no. 66. Bremer-David, Charissa, et al. Decorative Arts: An Illustrated Summary Catalogue of the Collections of the J. Paul Getty Museum (Malibu: J. Paul Getty Museum, 1993), p. 169, no. 287. "Museum Acquisitions in the Decorative Arts: Determination and Beneficence." Apollo 137 (January 1993), pp. 36-37, ill.
Bremer-David, Charissa. 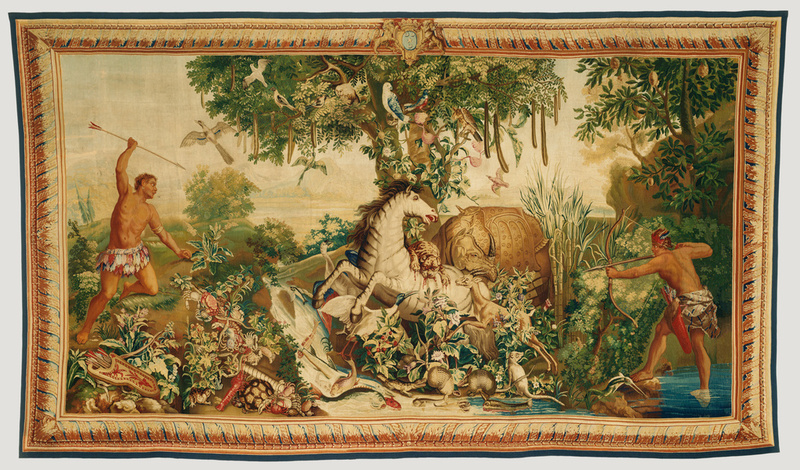 "Le Cheval Rayé: A French Tapestry Portraying Dutch Brazil." The J. Paul Getty Museum Journal 22 (1994), pp. 21-29. Scott, Christopher. "Textile experts mend the fabric of history." The Sun (Lowell, Mass., May 28, 1996), pp. 1, 4. Bremer-David, Charissa. French Tapestries and Textiles in the J. Paul Getty Museum (Los Angeles: J. Paul Getty Museum, 1997), pp. 10-19, no. 2. Wilson, Gillian, and Catherine Hess. Summary Catalogue of European Decorative Arts in the J. Paul Getty Museum (Los Angeles: J. Paul Getty Museum, 2001), pp. 148-49, no. 297. Forti-Grazzini, Nello. "The Striped Horse." In Thomas P. Campbell, ed. Tapestry of the Baroque: Threads of Splendor, exh. cat. (New York: The Metropolitan Museum of Art, with Yale University Press, 2007), p. 396 and note 46 on p. 397. The J. Paul Getty Museum Handbook of the Collections. 7th ed. (Los Angeles: J. Paul Getty Museum, 2007), pp. 220-21, ill.
Wilson, Gillian, et al. French Furniture and Gilt Bronzes: Baroque and Régence: Catalogue of the J. Paul Getty Museum Collection (Los Angeles: J. Paul Getty Museum, 2008), p. 374-75, app. no. 22, ill.
Klatte, Gerlinde, Helga Püssmann-Zemper, Katharina Schmidt-Loske. Exotismus und Globalisierung, Brasilien auf Wandteppichen: die Tentures des Indes (Berlin: Deutscher Kunstverlag, 2016), pp. 21, 95-96, 100, 195-197, 206, 351, 355-356, 363, 376, fig. III/2. Anderson, Carrie. "Material Mediators: Johan Maurits, Textiles, and the Art of Dipolmatic Exchange." Journal of Early Modern History 20 (2016), p. 79 and note 42 on p. 75 and note 55 on p. 79. Lesson in which students understand the Age of Exploration and the Scientific Revolution through studying European decorative arts.